I should start, again, with the note that I’m not a literary critic nor am I a book reviewer. Please, disagree with me. I’m also going to try to keep this closer to the length of a post and further from the length of an essay. If anyone out there wants to go deeper into these responses, let’s discuss in the comments. 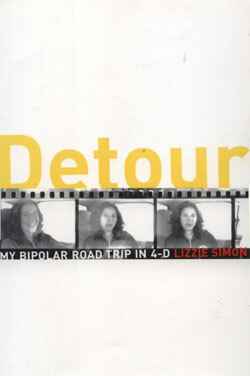 Earlier Reading Responses to Detour: My Bipolar Road Trip in 4-D are here: 1 and 2. (1) four-dimensionality. Don’t tell me this is just semantic. I have completely failed to see a fourth dimension to existence or vision or experience here. (Simon introduces the fourth dimension just by saying “[s]he’s survived mental illness and experienced a new dimension to existence, a fourth dimension” (64).) The wormhole I feel we have all fallen through at one point or another is just a pinch in the same space-time fabric that everyone else experiences, and I thrive off of knowing that. I haven’t fallen into another alternative reality. It’s the same reality, with a little wormhole. “In 4-D, he’s my prince, my warrior, my angel. But as mortal beings living one little moment at a time, Nick is a mentally ill coke fiend, resisting treatment to both conditions” (199). If the title is way simpler than I’m making it out to seem, then I have considered that it’s just about being able to see space relative to time given her lengthy discussion of herself at different ages and the present-day personification of a younger version of Simon. But you don’t have to be completely crazypants to reflect. I think I’m missing something in this title. (2) infantilization, caretaking, & the wisdom of children. Re the last note, this is a major recurring part of Simon’s description. The Detour starts when she decides that she owes some searching to a seventeen-year-old version of herself. She’s inspired and pushed by the wisdom of an eight-year-old version of herself. (I’d be screwed if I listened to what eight-year-old me wanted.) In addition to probing her own journals, one of the people she encounters with whom she identifies the most and in whom she seems to find the most joy is an eleven year old. “He’s [bipolar Nicholas, off his prescription meds and self-medicating with drugs and alcohol] a little boy. A sweet, gentle boy…” (83). Simon goes on to describe the need to “save” him, calling him a “project worthy of [her] devotion,” and I want to vomit (84). I read this, and I read the infantilization of a person in need of help. I need help sometimes, but that doesn’t make me a child. I also read a young twenty-something-year-old bipolar girl going through what we’ve all gone through — trying to save herself, trying to save the younger versions of herself she wasn’t able to save. She takes this road trip, because fulfilling a wish she had at eight would do some service to 17-year-old Lizzie…because working for those even younger girls is also a project worthy of her devotion. Not untrue, but that is a grown-up project for the grown-up self. (3) successful people. I might’ve missed it, but I don’t think I found a definition for “successful” in the book. I did find her saying that certain bipolar patients weren’t successful enough to warrant an interview. She also said she wanted to hear and tell “success stories.” But, still, I have no idea what the employed metric was. Clearly, I’m bringing this one up because of the mission of Define Functioning. I’m going to selfishly use this point as an opportunity to remind people that the definitions of “functioning” and “high-functioning” are always up for debate here. We’re self-identified. (4) the stuff. Loneliness, concepts of community, finding one’s “herd,” secrecy, hiding, anonymity. Check, check, check, check, check, and check. (5) what makes it a good book. I think I loathe this twenty-something-year-old Lizzie Simon, but I also think I loathe her because I might’ve been too much like her back then. Major psychotic manic episode, fancy college, being successful, trying to figure it all out, can’t maintain an apartment like a grown-up. I’m sure I probably don’t loathe the actual Lizzie Simon, and I know I love almost everyone she talks to on her journey. What makes this a worthwhile read for the high-functioning mentally ill (even if there are parts that make you want to vomit and parts that completely confuse you) is that none of the people who discuss their illness or recovery are exactly like me. They have different stories and different backgrounds and different methods of recovery (although I think only one goes through having a really hard time with meds). They are different enough that collectively they present a rather well-rounded snapshot (if just a snapshot) of being mentally ill and working things out to get by. Meredith, thank you for mentioning the ending. I didn’t want to talk about it for those who might want to read it and get there on their own, but I didn’t care for it either. I too think a lot of my opinion of the book stems from the fact that I am now too old to relate to it. (Well, that and I think young girls who have enough opportunity in their lives to spend part of high school in Paris should clarify what they mean by “successful” when categorizing other people.) If you decide to give it another read, let me know if your opinion is different. In the meantime, if you want a great read from someone who has lived almost a full lifetime with mental illness, who isn’t going to give helpful hints or self-help direction, I do highly recommend Mark Vonnegut’s book. I’m in the last 20 pages and will be writing a response soon.